Recently, UIDAI mAadhaar App launched as mAadhaar Apk which is download free for any Android Phone. If you have registered Aadhaar number can easily take benefit of the mAadhaar app which is officially announced by Unique Identification Authority of India (UIDAI) on Twitter. This is initiative of digital India mission of Modi government to make people aware about to use mAadhaar App and now you can carry your Aadhaar on mobile. mAadhaar is an official mobile app which is developed by UIDAI to provide an digital profile to Aadhaar Number Holders to carry their demographic information such as Name, Date of Birth, Gender & Address along with photograph as linked with their Aadhaar Number in any android smartphone. To use mAadhaar App on your mobile android smartphone, you need to have a registered phone number with UIDAI. There are some requirements to use and mAadhaar Apk Download free for Android phone users. 1) To carry Aadhaar profile on mobile. 2) Biometric locking and unlocking system. 3) Time-based One-Time Password generation. 4) Easy to update your profile. 5) Sharing of QR code and eKYC data by Aadhaar number holder. You must have registered mobile number to use a mAadhaar app. In case your mobile number is not registered with Aadhaar you should visit your nearest Enrolment Centre or Mobile Update End Point. mAadhaar Apk is easy to download free for your android phone which is available on google play store. This app is only launched for android users, it might be released for Apple IOS later on. 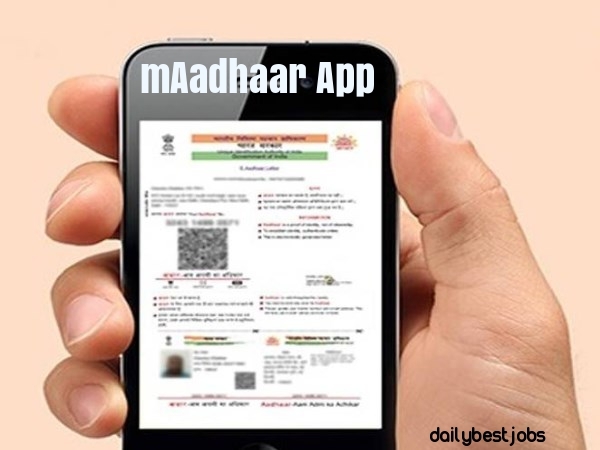 Download link: find below mAadhaar Apk Download link in the first step. STEP 1: Firstly, visit the google play store on your android mobile or click to go this link: https://play.google.com/store/apps/details?id=in.gov.uidai.mAadhaarPlus. STEP 2: Download and install the application by allowing it for necessary permissions. STEP 3: Open the mAadhar app on your mobile and create a password. STEP 4: Enter your Aadhar number or select the QR code to setup your mAadhar profile. STEP 5: You will receive an OTP on your registered mobile number after completing the above step, enter the OTP that you received and click to verify button. STEP 6: After mobile OTP verification your mAadhar profile would be setup and you will be able to lock/unlock the boimetric data. For more updates on mAadhaar App and mAadhaar Apk download, stay with us in future or bookmark our website to know more ahead. You can subscribe your email for free job alert as well as useful news related stuff.